One of the key players in securing American borders is the border patrol agent. Their job is vital to protecting the lives of U.S. citizens. Due to the nature of the job, this position can present dangers and challenges. What Does a Border Patrol Agent Do? As an agent, it is sometimes necessary to access parts of the border that are not reachable by traditional vehicles. Some agents are on horse, bike or all-terrain vehicles. There are also K-9 units, tactical units, search and rescue teams, and mobile response teams. Border patrol agents are stationed all along the Mexican border, in Texas, New Mexico, Arizona and California. They also work in states along the Canadian border, as well as additional locations in the Southeast and Puerto Rico. Find a complete list of locations here. To become a border patrol agent, there are basic requirements to meet as well as a nine-step process to complete. The nine steps may occur simultaneously or in a different order. 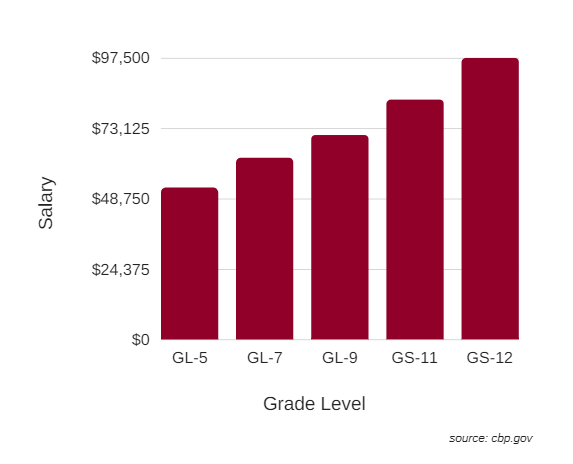 The first grade level, GL-5, requires at least one year of law enforcement work experience, or a bachelor’s degree from an accredited college or university. To be hired on at the GL-7 level, one year of work experience is also required, or a year of graduate level education related to criminal justice. The application process is “intentionally rigorous to ensure those selected can carry out the duties that are expected of them,” according to the U.S. Customs and Border Protection (CBP) website. Apply: To view Border Patrol vacancies, visit USA Jobs to get started and submit required documents. Take the entrance exam: The exam consists of two parts – an experience record that can be completed online in less than an hour, and a logical reasoning test that takes two hours and must be taken at a testing center. Those applying at the GL-9 level are not required to take this exam. Qualifications review: To apply for this, resumes should adhere to guidelines outlined on the CBP website. CBP provides a resume aid that can help with preparing the best structured resume for the job. HR specialists with USA Jobs will review the resume and rate applicants as eligible or ineligible. Background investigation: All applicants must complete and pass a background investigation, consisting of four parts: preliminary vetting checks, polygraph exam, investigation and final adjudication. Note: If backgrounds include illegal drug use, prior convictions or intentional harboring of someone entering illegally, applicants might be rated as ineligible. Medical exam: After passing the first four steps, candidates need to go through a medical exam, including vision and hearing screenings. Applicants must demonstrate they can perform essential job responsibilities without endangering their safety or the safety of others. Any sort of medical condition will be evaluated and judged on its own – no condition is an automatic disqualifier. Fitness tests: Applicants also need to demonstrate physical ability. The first test, a PFT-1, requires pushups, sit-ups and a step test. Each exercise has a required amount in a time limit. The PFT-2 happens immediately before the agent reports for duty, and includes a 220-yard run, sit-ups, pushups and a 1.5 mile run. Each of those need to be completed in a certain amount of time as well. Structured interview: The interview will be conducted by a board of current Border Patrol agents, and they will judge applicants on decision-making skills, emotional maturity, interpersonal skills and sensitivity. Polygraph exam: This exam is required by law and is a 4- to 6-hour process where applicants answer questions on national security and information from their background checks. Drug test: As a Border Patrol agent, involvement and exposure to illegal substances are required. Applicants will have to take a random drug test and if they fail, they will be disqualified from the hiring process. The Bureau of Labor Statistics does not specifically track border patrol agents, but predicts that police and detective employment will increase 7% by 2026. However, an executive order issued by President Trump in early 2017 calls for hiring an additional 5,000 border patrol agents and those vacancies will need to be filled.